Can’t watch the NFL playoffs on TV? Here are a few options that will allow you to listen to all the action live online. We took a close look at Audio Pass in the regular season, and now you can purchase NFL Audio Pass for the playoffs, including the Super Bowl, for $14.99. You can choose to listen to either teams radio broadcast crew, or a national radio broadcast, and all games are also available on demand shortly after the end of the game. 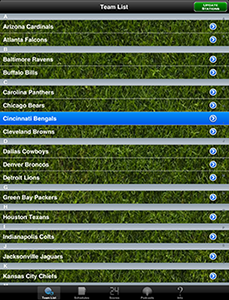 The app features NFL.com Game Center and NFL Mobile app integration which allows you to log in and listen through the NFL.com Game Center or NFL Mobile app. Access begins January 3rd through February 10th. You may be able to find a live stream for free on your mobile device or browser with TuneIn Radio. 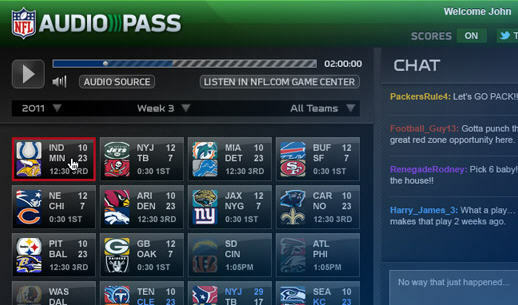 By going to the NFL page on Tunein.com, or by browsing with the Tunein Radio app, you may be able to find a live stream. Many of these will be blocked, but often you can find a good stream with enough trial and error. The TuneIn Radio app can be a bit tricky to navigate if you are looking for NFL games. I’ve found the best way is to do a search on one of the teams that’s playing (Cincinnati Bengals, for example), select Browse : Cincinnati Bengals, and then try the different radio stations that a listed in the results. The browser version is similar, go the the NFL Radio page on Tunein.com, select a team, then select a station. 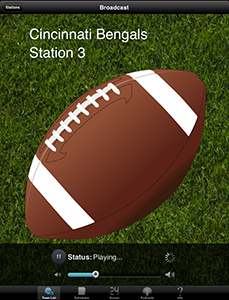 The Pro Football Radio and Scores app delivers live audio feeds of NFL games. Each team has a collection of feeds. It’s normal to find some of them aren’t working, but the developer does a real nice job of updating the feeds and I can’t recall having had an issue finding a specific game. The app is available for $.99 for iOS and Android. If you want to be assured you won’t miss any of the game or want to take advantage of on-demand availability, NFL Audio Pass is your best bet. If you don’t want to drop the cash, try one of the other options.